Despite the iMac moniker, the iMac Pro is a very impressive machine. 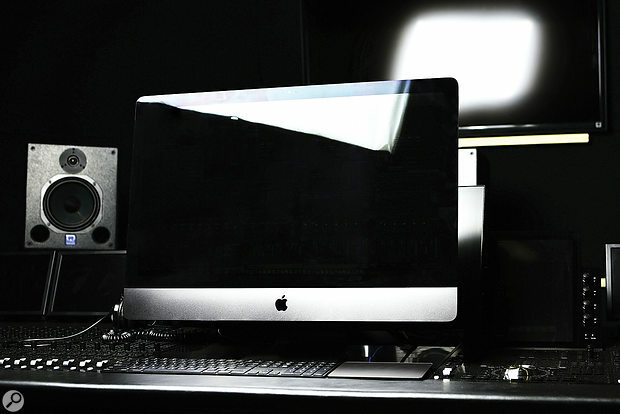 Is it the computer that Mac‑based musicians and audio engineers have been waiting for? I don’t think it would be unfair to suggest that Apple’s strategy for professional desktops has been rather confusing over the last few years. In 2013, perhaps due to the pressure of not having significantly upgraded the Mac Pro in three years, the company made the somewhat unprecedented move of presenting a ‘sneak peak’ of the next‑generation model. Released into the market six months later, the new Mac Pro was quickly dubbed — and not with a sense of affection, I think — the ‘trashcan’. It was a bold design choice, to be sure, eschewing internal upgradability in favour of external expansion connected via Thunderbolt. But Apple ended up creating a system that even the company themselves couldn’t upgrade: no new Mac Pro model based on this design ever appeared. Last year, in April, Apple’s Senior Vice President of Worldwide Marketing, Phil Schiller, admitted the company were “completely rethinking” the Mac Pro, conceding that while the trashcan had suited some professional workflows, it hadn’t succeeded in others. He went on to say that Apple were in the process of developing a new, ‘modular’ Mac Pro, now scheduled for release next year. However, what wasn’t disclosed in this discussion about the company’s future ‘pro’ Mac plan was that, in typical Apple fashion, they had ‘one more thing’ up their sleeve. Two months later, at the company’s 2017 Worldwide Developers Conference, the iMac Pro was announced. Though nearly physically identical to the regular 27‑inch iMac, the iMac Pro is distinguished by its Space Grey finish. This appearance is carried through to the supplied Magic Keyboard (with a numeric keypad), the optional Magic Trackpad 2, and the black — sorry, I mean Space Grey — Magic Mouse 2. The keyboard has the same feel as the so‑called Butterfly mechanism Apple use on the latest MacBook Pros, and I have to say that I’m not a fan. There’s less key travel, and it feels a bit like playing the harpsichord in that you can feel the click of the key as you press it. Admittedly, whether you like the feel of the keyboard or not is obviously a personal preference, and you can always use an alternative keyboard if you prefer. Similarly, I’ve never really liked the Magic Trackpad, although there’s one really good reason to get one with the iMac Pro as the latest model supports Force Touch. This enables you to perform certain actions more efficiently by applying a little more pressure; so in the Finder you can Force Touch a file to trigger Quick Look, for example. Logic Pro X also supports Force Touch, allowing you to create a Region by Force Touching in the Workspace, or create a Marker by Force Touching in the Marker Track, to name but two handy shortcuts. 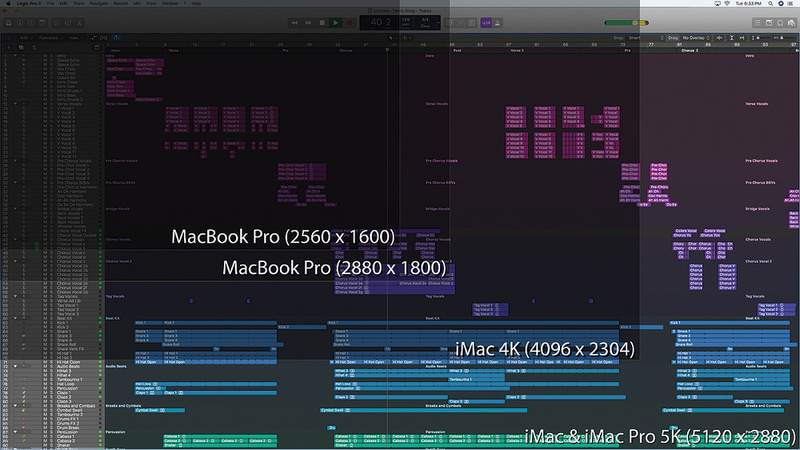 Here you can see a comparison between the different Retina displays used by Apple’s iMac Pro, iMac, and 13‑ and 15‑inch MacBook Pros. The iMac Pro features the same gorgeous 5K (5120x2880) Retina display as the regular iMac, and applications that take advantage of this, such as Apple’s own Logic Pro X, look incredible. The iMac Pro offers fairly generous connectivity options. 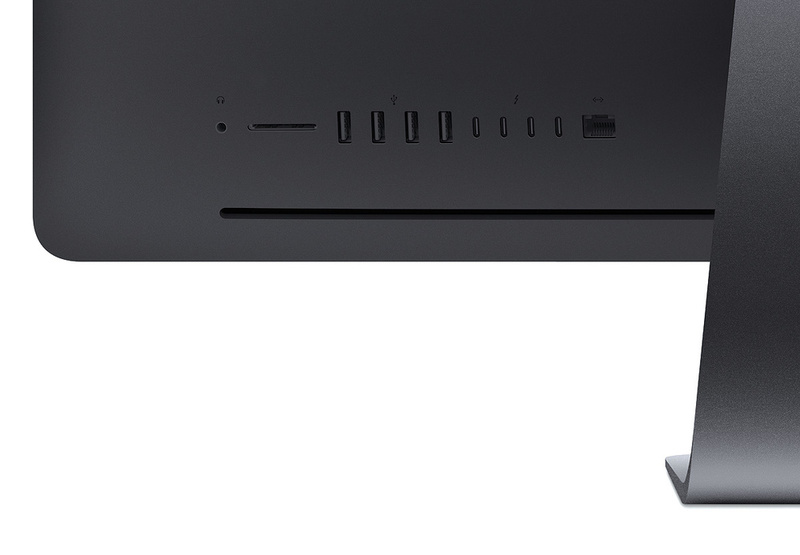 At the back we find a headphone jack, a UHS‑II SDXC card slot, four USB‑A ports, four USB‑C ports (that support DisplayPort 1.2, Thunderbolt 3 and USB 3.1) and a 10‑Gigabit Ethernet port.You also get similar connectivity to the regular iMac models: there’s a headphone jack, a UHS‑II SDXC card slot, and four USB‑A ports supporting USB 3. However, the iMac Pro offers four USB‑C ports (there are two on the iMac) that support DisplayPort 1.2, Thunderbolt 3, and USB 3.1, and — for the first time on a Mac — there’s a 10‑gigabit Ethernet port. This latter inclusion is actually a big deal, especially for those working in high‑end audio post‑production facilities. And in terms of wireless networking, the iMac Pro is equipped with both 802.11ac and Bluetooth 4.2. Internally, things are even more interesting. The base model is powered by a 3.2GHz eight‑core Intel Xeon W processor (see box), with 32GB of DDR4 ECC memory running at 2666MHz, a 1TB SSD, and a Radeon Pro Vega 56 GPU with 8GB of on‑package HBM2 (High Bandwidth) memory. Should this base specification be insufficient, there are, of course, many configurable options, as detailed in the ‘Tasting Menu’ box. The top‑of‑the‑line model would feature a 2.3GHz 18‑core Xeon W processor, 128GB of memory, 4TB of SSD storage, and a Radeon Pro Vega 64 GPU with 16GB HBM2 memory. And if your wallet would allow, this would be quite a formidable system. Even though today’s chips are more power efficient than ever, to incorporate such workstation‑class components in an iMac‑sized enclosure Apple’s engineers had to create an impressive new thermal architecture. Based around dual‑centrifugal fans, with an improved heatsink and additional venting, the iMac Pro offers nearly 75 percent greater airflow than the regular 27‑inch iMac and an 80 percent increase in thermal capacity. What these numbers mean is that the iMac Pro is astonishingly quiet when you consider the performance. I used and witnessed the iMac Pro in many acoustically‑balanced rooms and at no point was the fan any more audible than the hum created by other pieces of equipment in the room. Remarkable, to say the least. 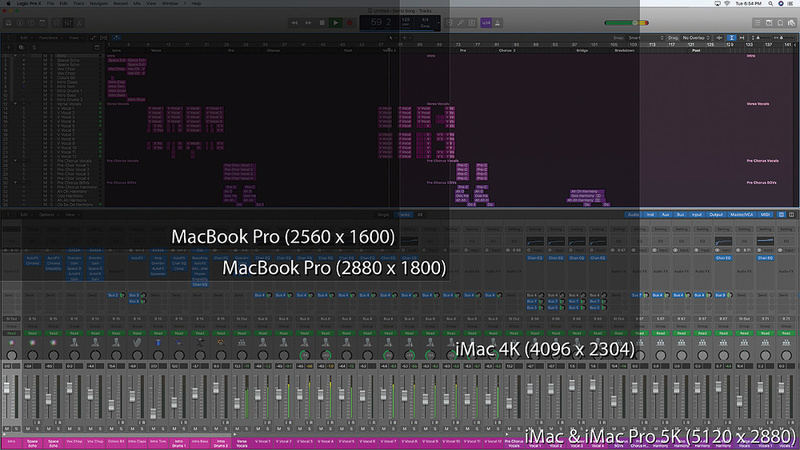 Here’s a similar comparison, this time showing you the maximum number of tracks visible in Logic on different size displays. For me, the most interesting component in the iMac Pro’s architecture is the new, Apple‑designed T2 chip. Since releasing the iPad in 2010, which featured the custom A4 chip (based on the ARM architecture), Apple have been differentiating their products with the company’s own silicon. Apple incorporated some of this work in a Mac for the first time with the latest generations of MacBook Pros, using a custom chip dubbed the T1 to provide Touch ID with a so‑called Secure Enclave to keep your fingerprint data protected. The T2 chip also features a Secure Enclave for handling encryption, but goes much further by incorporating the System Management Controller (which handles thermal and power management), an image signal processor for the FaceTime HD camera, an audio controller, and also an SSD controller. 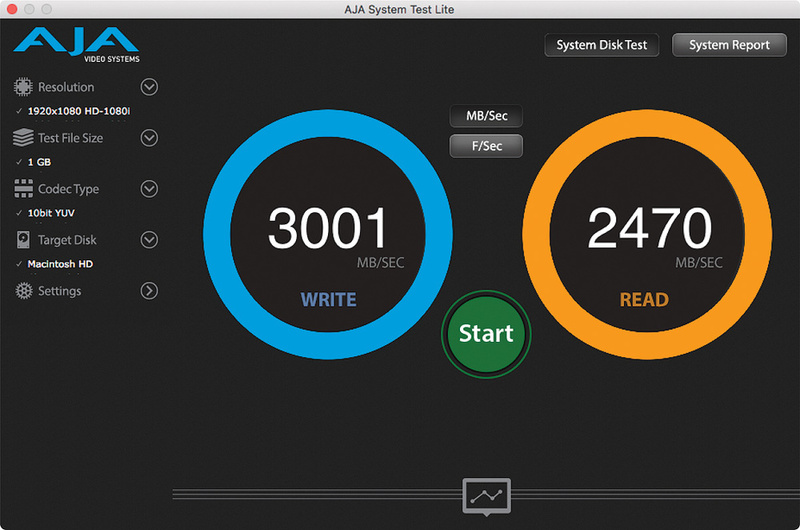 The read and write results of the iMac Pro’s internal storage, as reported by AJA’s System Test, using a file size of 1GB.Speaking of storage, the iMac Pro offers two SSD modules to provide up to 4TB of flash storage with maximum read and write throughputs of 3.3GB/s and 2.8GB/s respectively. Using AJA’s System Test, I was able to roughly confirm these figures, achieving read and write speeds of approximately 3GB/s and 2.47GB/s using a test file size of 1GB. So I think it’s safe to say that track counts aren’t going to be a problem, and even when running large, third‑party sample libraries from the likes of Spitfire Audio, I encountered no problem in terms of performance. Though the maximum 4TB configuration won’t be enough for those with a vast collection of libraries, I guess that’s what the Thunderbolt 3 support is for. Finally, in discussing the hardware, Apple have been doing a great job with audio reproduction of late: the MacBook Pro easily has the best sound I’ve heard on a laptop, and the AirPods and HomePod [see SOS June 2018 review] arguably have the best acoustic responses in their respective price ranges. The iMac Pro continues this pattern with certainly the best‑sounding (and loudest) speakers heard in an all‑one computer. Sure, you’re not going to do any serious monitoring with these built‑in drivers, but you have to admire the work that went into them. With such impressive specifications on paper, just how powerful is the iMac Pro? Apple sent me the 10‑core model for review, and Geekbench rated this system with single‑ and multi‑scores of 5478 and 37183 respectively. To put this in perspective, the most expensive Mac Pro currently available (which features a 12‑core processor) has single‑ and multi‑core results of 3357 and 26216, according to the Geekbench Browser. One shouldn’t pay too much attention to the single‑core benchmark, since clock speeds decrease with a greater number of cores; but the multi‑core number obviously represents a significant improvement. Although, this shouldn’t be entirely surprising since the Mac Pro was announced five years before the iMac Pro. But what does this increase mean in the real world? Geekbench scores are useful in gauging raw technical performance, but they don’t always offer much insight into how this performance translates to the use of music and audio software. So to get a better sense of this, Apple supplied me with some performance data gathered from the company’s own in‑house testing, some of which is available on the iMac Pro’s product page on Apple’s web site. The baseline for these tests was the top‑of‑line 27‑inch iMac, featuring a 4.2GHz quad‑core Intel Core i7 processor with 64GB RAM — which, in and of itself, isn’t a badly spec’ed machine. This was compared against a 2.7GHz 12‑core Xeon E5 Mac Pro, and two pre‑production iMac Pro models: one powered by a 3GHz 10‑core Xeon W, and the second by a 2.3GHz 18‑core Xeon W. Both iMac Pro systems had 128GB, and the software used to conduct these tests was a pre‑release version of Logic Pro 10.3.3 — naturally! 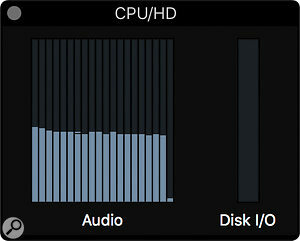 Logic’s CPU window displaying the effect 200 instances of Sculpture playing back simultaneously has on performance.To test the performance of effects plug‑ins, a project was created with 253 tracks, each containing an Amp Designer instance, and tracks were enabled until the CPU became overloaded. In this test, the Mac Pro performed 1.5x better than the iMac, while the 10‑ and 18‑core iMac Pros provided a 3.8x and 5.6x improvement respectively. Turning to an instrument plug‑in, Apple created a project with 200 audio instrument tracks using Sculpture, and in this case the Mac Pro scored 1.8x higher than the iMac, and the 10‑ and 18‑core iMac Pros showed an 8.3x and 12.4x improvement. The final test Apple performed concerned offline bouncing, where a project containing 20 audio tracks was bounced to disk in PCM format. Here, the Mac Pro was 1.5x quicker than the iMac, with the 10‑core and 18‑core iMac Pros carrying out the bounce 3.7x and 4.6 times quicker — which is obviously a big difference when you’re sat around twiddling your thumbs waiting for the operation to complete. Because Apple only supplied the performance improvement deltas, rather than how many tracks and instances could be activated, I decided to recreate these tests to better understand the results. Obviously, my findings are only relative, since I didn’t have access to the exact settings and content Apple had used, and I was also using a production iMac Pro running a release version of Logic Pro 10.4.1 on Mac OS (High Sierra) 10.3.4. 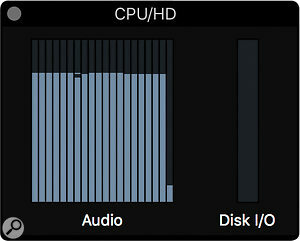 This was what Logic’s CPU window looked like when running 253 tracks of Amp Designer.Running 253 audio tracks, each with an instance of Amp Designer, Logic’s CPU window showed I was using just under 50 percent of the available resources. And, looking at the system performance in Activity Monitor, Logic was using around 638 percent of the CPU, while the User CPU usage was around 32 percent. I tried this test with both mono and stereo instances, and the stereo version used ever so slightly more CPU, which was rather surprising. In testing Sculpture, I created a project with the same 200 audio instruments, each playing an arpeggiated semiquaver pattern at 120bpm — and for good measure, I enabled Sculpture’s new High Definition render mode, introduced in Logic Pro 10.4. Again, the results were surprising: this time, Logic’s CPU meters showed I was using close to 90 percent, with Activity Monitor showing a 1172 percent CPU load for Logic and 58 percent User usage. I don’t know how close I got to Apple’s own testing methodology, but I was impressed nonetheless. Finally, I offline‑bounced the ‘Colors’ [sic] demo song included with Logic Pro 10.4, and this 4:24 project, with some 135 tracks, took just 36 seconds to bounce as a 24‑bit PCM, interleaved Wave file with normalisation disabled. 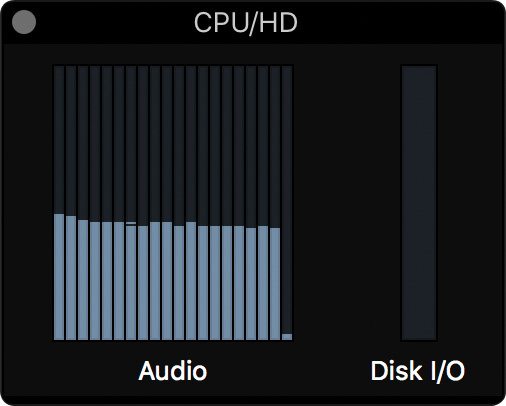 Now this figure isn’t particularly meaningful by itself, but if you’re running Logic Pro 10.4 already, you can try the same bounce on your current Mac and compare the performance with the 10‑core iMac Pro I was using. A cynic might suggest the iMac Pro is a stop‑gap, a product Apple released to appease professional users whilst the company figures out the next Mac Pro. But such an opinion would be entirely wrong; the only two things the iMac Pro and the iMac have in common are the form factor and the name. The iMac Pro’s internals are so ridiculously advanced, the only criticism you could feasibly make is that Apple have in fact over‑engineered this computer. I can’t think of one technical compromise, from the use of a workstation‑class processor with the necessary thermal engineering, to a custom controller chip and offering a 10Gb Ethernet port. The only possible downside is that these decisions have resulted in a machine with a fairly hefty price tag — but you get what you pay for. At £4899$4999, the base iMac Pro model is, I think, the most expensive entry‑level professional Mac yet. The Mac Pro starts at £2999$2999, although doesn’t include a 27‑inch 5K display or any of the iMac Pro’s advanced functionality. Also, when you consider the competition on other platforms, you’d have to spend quite a bit more for an equivalent specification, and, again, that’s not taking the display into account, although you do admittedly get more flexibility in terms of internal expansion. Apple have really hit it out of the park with this computer, with a product that provides both stellar and elegant performance for musicians and audio engineers. If you want the most advanced Mac ever designed and are prepared to pay for it, the iMac Pro won’t disappoint. So in answering the question posed by the intro text at the beginning of this article, I would have to respond with an emphatic yes. 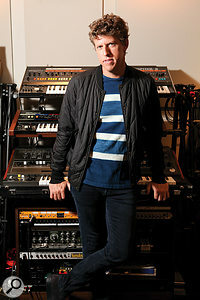 Photo: Peter HillWhilst writing this review I had the opportunity to speak with Greg Kurstin, a Grammy‑award‑winning record producer, songwriter, and musician who’s worked with Beck, Adele, Sia, and Foo Fighters, to name but a few of the well‑known names on his résumé. Apple had given him a pre‑release iMac Pro to get feedback from a professional musician, which, in and of its self, should be reassuring to any Mac‑based musician or audio engineer. And since production models became available, he’s been working with an iMac Pro featuring the same configuration as the unit Apple supplied for this review. The notion of a computer with an all‑in‑one form factor aimed at the professional market might seem disconcerting to some at first. 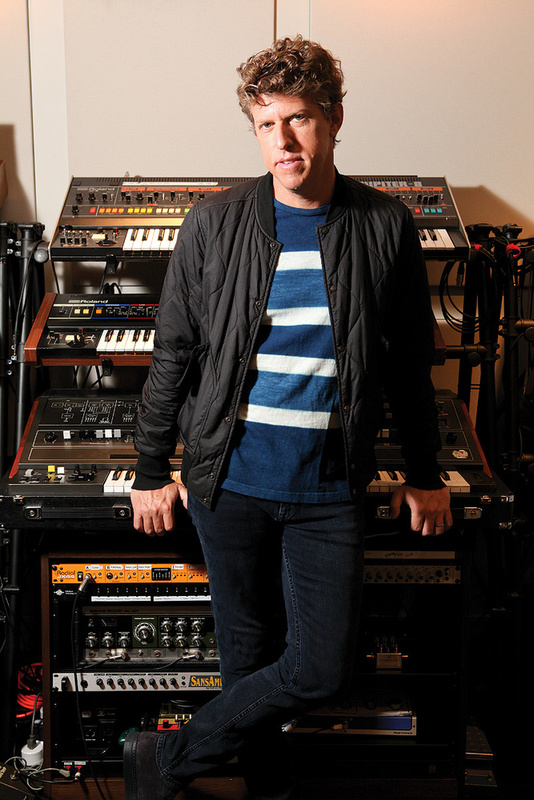 Musicians and audio engineers are, after all, used to a computer you put in a rack and hide away somewhere — preferably in a machine room. However, I have to say that while the all‑in‑one form factor might be off‑putting to some professionals, it honestly didn’t bother me once I sat down and started using the iMac Pro, and I think there are two reasons for this. Firstly, the display is fantastic, and you can always connect a bigger one if 27 inches isn’t enough: either two external 5K or four 4K screens are supported. But secondly, I think Mac users have gradually accepted the lack of being able to put PCIe cards inside their computer of choice over the last five years. And while I’m not saying I think Apple were right to force this change — there are still plenty of audio (and video) cards professionals rely upon — the Thunderbolt landscape is significantly different today than when the ‘trashcan’ was previewed in 2013. I’d posit there’s also a third reason, because Apple aren’t the first company to release an all‑in‑one computer for creative professionals. HP were arguably the first to do this with the Z1 in 2012, and Microsoft had a unique take with the Surface Studio, launched in 2016. However, I think the all‑in‑one nature of the iMac Pro extends to how Apple intend for it to be used. This is clearly a computer designed with the assumption you can do all your work using this one machine; and, for the majority of cases, you absolutely could. For those with rigs relying on multiple systems — and I’m specifically thinking of media composers who might rely on auxiliary systems running software such as Vienna Ensemble Pro — I don’t think it would make sense to use iMac Pros as slaves (unless your budget allowed). But even in such situations, the iMac Pro would still be a terrific front‑end sequencer computer, especially as you have the 10Gb Ethernet port to communicate with a network of other systems streaming audio. The Xeon W‑series processors used in the iMac Pro are based on Intel’s Skylake microarchitecture, first released in 2015, rather than the newer Kaby Lake variant, which was released in 2017 — the same year the iMac Pro was announced. 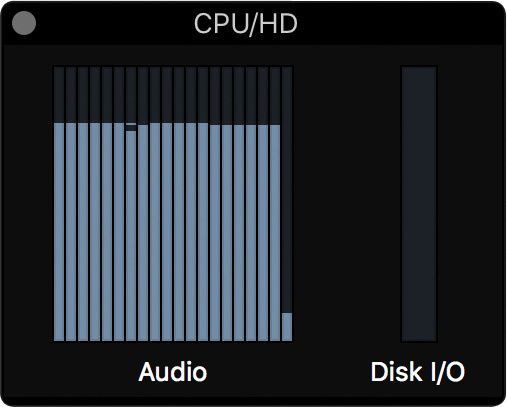 As you would expect, there’s support for Hyper‑Threading, so each core can handle two threads at the same time, and this is why in the screens of Logic’s CPU window you see 20 CPU performance meters rather than 10. Skylake also implements Intel’s Turbo Boost 2 technology, allowing the clock speed of the processor to be dynamically overclocked as required. One aspect of the Skylake architecture that really contributes to the performance of music and audio applications is a set of advanced vector extensions known as AVX‑512. The 512 refers to the word length of the registers, meaning that AVX instructions can operate on 512 bits of data simultaneously: you can process 16 32‑bit floating‑point (single prevision) values or eight 64‑bit values per second per clock cycle. Given that native audio software uses 32‑bit floating point arithmetic for the majority of signal processing tasks — not to mention that we’re increasingly seeing mixers processing audio with 64‑bit precision — this is a big deal. And the Xeon W chips include two AVX‑512 units, further doubling the performance. 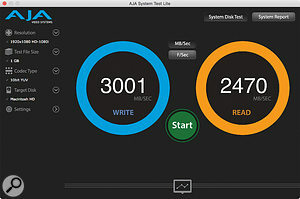 Apple’s own Accelerate framework supports AVX‑512, so if an application makes use of this framework, a simple recompile with the latest version will give that application an automatic performance improvement when running on the iMac Pro. Unsurprisingly, Apple’s own Logic Pro X already takes advantage of these extensions, and I’m sure we’ll see support from third parties in the future, especially since Macs aren’t the only computers that offer chips with this instruction set. The Space Grey Magic Trackpad 2 costs £50$50 as an alternative to the Magic Mouse 2, or for £149$149 you can get both. And for an extra £540$600 you can enjoy a Radeon Pro Vega 64 GPU with 16GB HBM2 memory, although this is probably unnecessary for those without music and audio allergies. Truffles are included at the discretion of the chef. USB-C connectors are used, but not to the exclusion of USB-A. The all-in-one design might not appeal to everyone. Expensive, though not overpriced when you consider the technology. The iMac Pro is the most impressive Mac yet, and a dream come true for Mac-based musicians and audio engineers. Apple iMac Pro with a 10-core Intel Xeon W-2150B processor, 128GB memory, and 2TB storage. Mac OS High Sierra 10.13.4.